Here is another great giveaway! PI of Products reviewed some products from John Paul Pet. Yes, believe it or not we still have some pet reviews. She used the John Paul pet on her Shetie's pups. They are so cute! read below to see what she had to say. We have a couple more pet producst (I believe:). This one is from John Paul Pet and has been PERFECT for our pups. Grace's puppies needed bathed, but we wanted something that would be okay to use on them at about five weeks old. With the Awapoochi Shampoo and Conditioner Rinse that is Paraben and EDTA free (also tested on humans first), I knew that we would be okay. Here is a little bit about John Paul Pet... "30 years ago John Paul DeJoria, co-founder of John Paul Mitchell Systems, revolutionized the professional salon industry by banning animal testing for his line of hair products. John Paul’s in-depth expertise in hair and skin care formulations also led to research in new standards for pet grooming and hygiene, which lead to the creation of John Paul Pet shampoos, conditioners, sprays and pet wipes. John Paul Pet shampoos and conditioners are pH balanced so they don’t irritate sensitive pet skin and the entire line is “tested on humans first” to ensure effectiveness and safety for all pets. John Paul Pet actively supports programs benefiting all animals, including Best Friends Animal Society, The Morris Animal Foundation, PAWS, The California Wildlife Association, The Humane Society of the United States, as well as numerous Humane Society of America and SPCA events, pet rescue organizations and pet charities nationwide." Sophia was the first one to use these and she really seemed to enjoy her bath. It lathers up really nice and rinses out pretty easily. It also makes them smell A LOT better! :) You know how puppies can get playing together. As a side note, I noticed my hands felt really soft after bathing the pups. Next are the John Paul Pet Care Wipes. 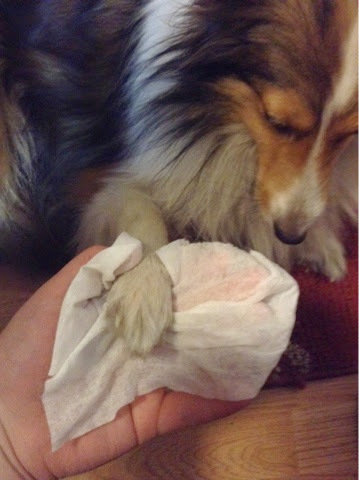 I received the fresh mouth - Tooth &amp; Gum Pet Wipes, the clean face - Ear &amp; Eye Pet Wipes, and the healthy paws - Body &amp; Paw Wipes. 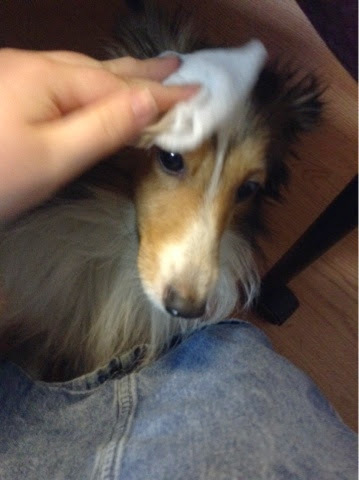 These are moistened wipes and they really do seem to help clean them up, when you don't want to give them a whole bath. Perfect for cleaning wet muddy feet when they come in from outside. We have also used these on the puppies when they play in their food and just need a little cleaning. This is so much better than having to bathe them several times a week. Really nice! So, it is well worth purchasing John Paul Pet Care products. You can purchase the John Paul Pet Care 3-Pack on the John Paul Pet website. You can also Like them on Facebook and Follow them on Twitter to stay up to date with their latest news. 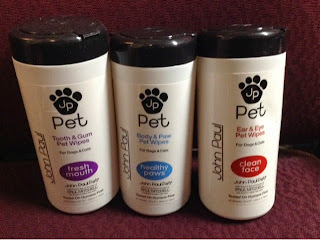 John Paul Pet is going to send 1 of our readers a John Paul Pet Care 3-Pack! John Paul Pet is a #1 Petacular Product! What do you think? This product was gentle enough to use on her pups! They are so adorable! Make sure to enter this giveaway soon! Thanks for stopping in. I like the Tea Tree Conditioning Spray. In additional to my five Treeing Walker Coonhounds, I have three cats. My Moko has sensitive skin and I've been looking for a product that I can use to give her baths without it irritating her sensitive skin. I'd love to try their Oatmeal Shampoo for cats. I would like to try the dog wipes. I think it would be great for dirty paws. I'd love to try the Tea Tree Shampoo for our dogs as well! I like the Full Body & Paw wipes. One of my dogs despises water. I would love to try the Waterless Foam Shampoo for her.